Line with parchment paper a 13″ x 9″ swiss roll tin. Preheat the oven to 180oC. Break the chocolate in pieces,into a bowl sitting over a pan of simmering water and allow to melt,set aside and allow to cool slightly.Whisk the egg yolks & sugar until thick & pale in color.In a separate bowl whisk the egg whites until stiff.Next, GENTLY fold the chocolate into the egg yolk & sugar mixture followed by half the egg white. Add the remainder of the egg white to the mixture,lightly folding as you go. Pour into the tin and bake for 20-25 minutes until the centre is slightly spongy to the touch. 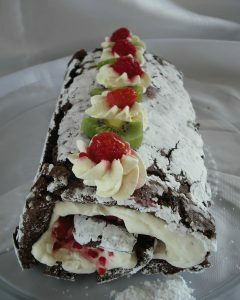 Remove from the oven and allow to cool in the tin.At this stage you could cover the cake with a damp tea towel for up to a day until ready to fill.Place a sheet of parchment paper on a work surface and dust with icing sugar.Turn the roulade out onto a sheet and carefully peel off the lining paper. For the raspberry filling, place the fruit in a saucepan and add the 25g sugar.Bring gently to a medium heat to allow the sugar to dissolve and the sauce to thicken slightly.Remove from the heat and allow to cool. Spread the fresh cream over the roulade, leaving a little behind for piping some rosettes on top.Spoon over the raspberry filling evenly on top using a slotted spoon.You can use the juice as a sauce . Have the longer side of the roulade facing towards you.Using the parchment paper to help guide you, roll the roulade into a roll, if you wish for neatness you can trim a little of each end of the roulade. Decorate the top using a piping bag fitted with a star nozzle with the remainder of the cream and place a fresh raspberry and a sprig of mint on top of each rosette. Transfer to a serving plate and slice at the table. Serve with a drizzle of raspberry sauce. YUM! !